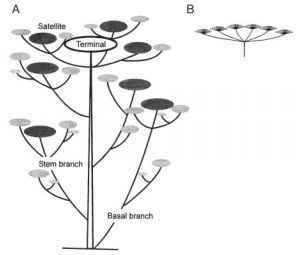 Tree mechanical design against buckling  or breakage  has been studied for over a century. Most existing models (see  for a synthesis) have considered the tree as a vertical, tapered pole of a homogeneous material, loaded either by static, lateral wind forces, or by its own self-weight, with a perfectly stiff anchorage. Therefore, the functional traits involved and analyzed with regards to their contribution to the risk of mechanical instability are typically: the characteristics of pole size (volume, diameter, or height), pole shape (slenderness, taper, cross-sectional shape), material properties (modulus of elasticity, occasionally torsional modulus, failure criteria usually given by a single critical stress), self-weight (density of the pole material and additional weight of the crown), or structural parameters that define wind forces (drag coefficients and crown area ).